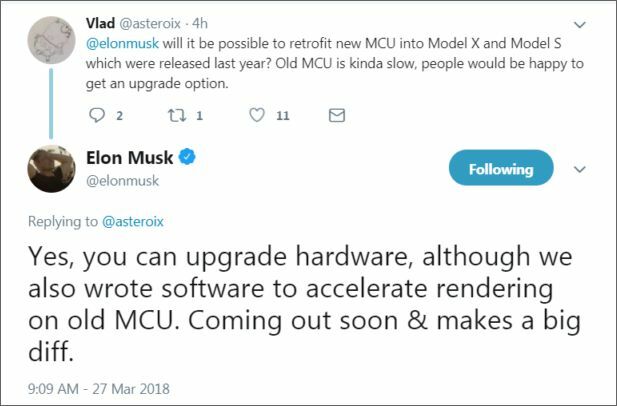 On the Model S and X, the MCU main computing unit, in late February 2018 production was upgraded to a newer design “MCU2” switching from an Nvidia quad-core CPU to one based on the Intel Gordon Peak board, similar to that used in the Model 3. The bluetooth and WiFi were also upgraded. As of this writing, we are not aware of any new features being active with the MCU2 over MCU1, other than the touch response and display updates are faster and 5 GHz WiFi. The Bluetooth changes may allow fobless operation using your cell phone, similar to the Model 3. It appears due to a new wiring harness and new Bluetooth and WiFi antennas, the MCU2 is not a drop-in replacement for cars with MCU1, but with additional wiring or eliminating some new features it may be possible. It’s unclear when this option might be available and at what cost. We expect some enterprising owners will do their own retrofit. Aside from the MCU2 cost ($2250*) and wiring/antenna changes – accessing the MCU is not easy. Replacement requires some labor to pull apart the dash to get to the MCU. In addition, it’s unclear if basic car data, such as odometer, trips, other user data and preferences can be transferred from MCU1 to MCU2. * Current Tesla parts cost & labor to install MCU1 out of warranty. MCU2 is not a part sold currently (i.e. every MCU2 car is in warranty).